India and Germany enjoy a strong partnership based on shared economic and strategic interests. Germany is India’s largest trading partner in the European Union and the seventh largest source of foreign direct investment (FDI). Noted German firms such as Bosch, Volkswagen, Basf, Bayer, Braun, and Adidas are already firmly established in the Indian market. These brands either manufacture their products in the country or provide their services in the technology and engineering sectors through joint ventures (JVs) with Indian businesses. Germany and India hold an Inter-Governmental Consultation (IGC) every two years to discuss and broaden areas of cooperation. The latest such consultation was held in May 2017 in Germany, where the two countries committed to extending their partnership to new areas, such as solar and other forms of renewable energy. 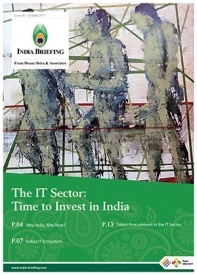 German investment in India has steadily grown in the past two decades, reaching to a total of US$11.78 billion (€9.6 billion) from 2000 to 2016, and is concentrated in manufacturing and heavy industries – industrial equipment, automobiles, metallurgy, leather, and pharmaceuticals – as well as in the IT sector. For one, Germany’s advanced capabilities in science and engineering complement the needs of the rapidly growing Indian economy, which seeks to broaden its manufacturing base, accelerate urbanization, and improve infrastructure. Additionally, German companies can generate relevant jobs to absorb India’s large labor force trained in science and technology. These growth concerns motivate much of the Modi government’s economic agenda, as illustrated in their flagship programs: Make in India, Skill India, Digital India, and Smart Cities. India has actively sought German participation and investments in these areas, capitalizing on strong existing bilateral business and commercial ties. In particular, India is wooing German small and medium enterprises (SME), called Mittelstand, to start operations in India. Towards this, the Modi federal government has already created a special window under ‘Make in India-Mittelstand’ (MIIM) at its Berlin embassy to facilitate the entry of Mittelstand into the Indian market. 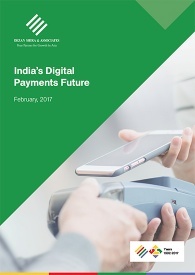 So far, 73 Mittelstand companies are part of MIIM, of which 46 have begun operations in India. These companies belong to diverse sectors, including renewable energy, engineering technologies, construction technologies, agricultural mechanization, water technologies, and waste management. Major German companies have already established manufacturing plants in India. BASF, the world’s leading chemical engineering company, has nine manufacturing plants in India, making a range of products that include: agrochemicals, battery chemicals, and mattress foam. Automotive powerhouses Mercedes Benz and Volkswagen, both, have plants in Maharashtra and Gujarat, respectively. Further, companies like Siemens, Bosch, and BASF are heavily invested in R&D activities in India to develop products customized for Indian consumers. 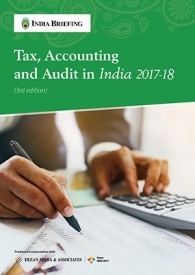 Most German companies prefer to partner with a local Indian company for their operations, to ease their navigation of India’s legal and regulatory landscape. This strategy has worked well for German companies over the years; they have come to better understand the Indian market and have begun to customize their products accordingly. There are about 1,600 German companies currently operating in India through Indian partners or subsidiaries. In addition, Mittelstand companies predominantly operate through JVs in the country; there are over 500 such ventures at present. In terms of trade relations, during 2016, Indian imports from Germany accounted for 56 percent of trade, while exports to Germany made up for 44 percent of the total trade between the countries. As shown in the figure below, trade between the two countries peaked in 2011-12, after which it began declining – an outcome of the global economic slowdown. Still, the trade volume continues to be steady and both countries have reaffirmed their commitment to promote trade relations. 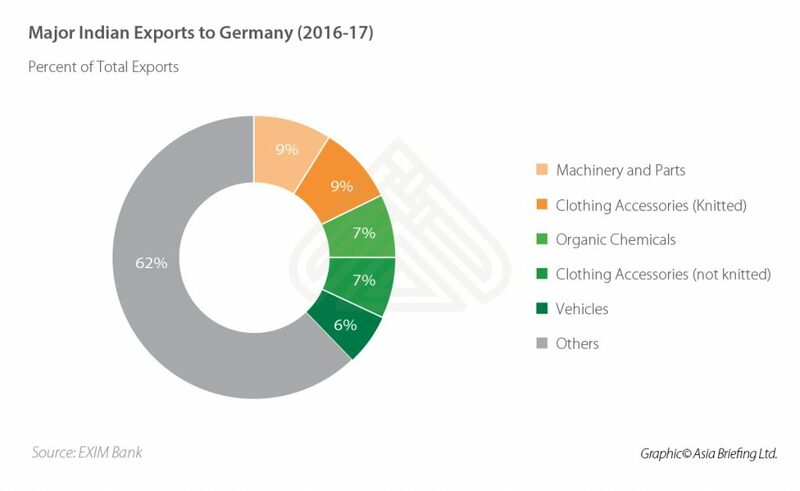 Among others, major items exported from India to Germany include: machinery, organic chemicals, clothing accessories, vehicles, metal and metal products, food and beverages, and pharmaceuticals. The figure below shows the share of these products in the total export portfolio. 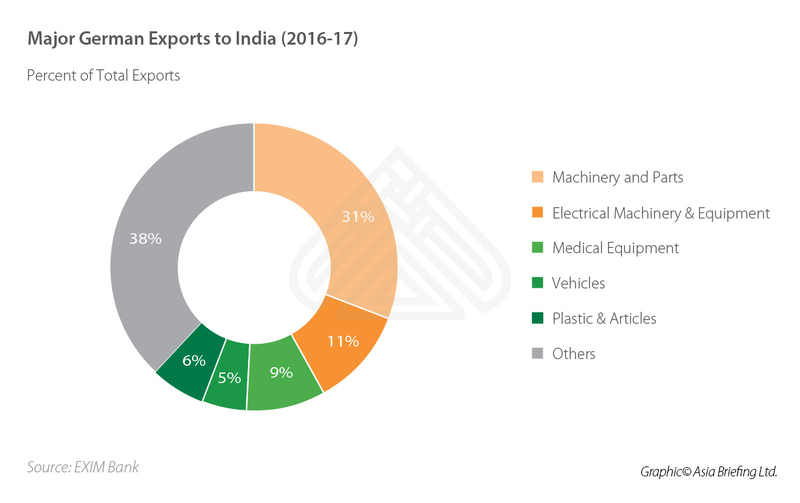 Major German exports to India include: machinery and parts, electrical machinery and equipment, vehicles, medical equipment, chemicals, auto components, and plastics. In the figure below, we see the share of these items in the total export. 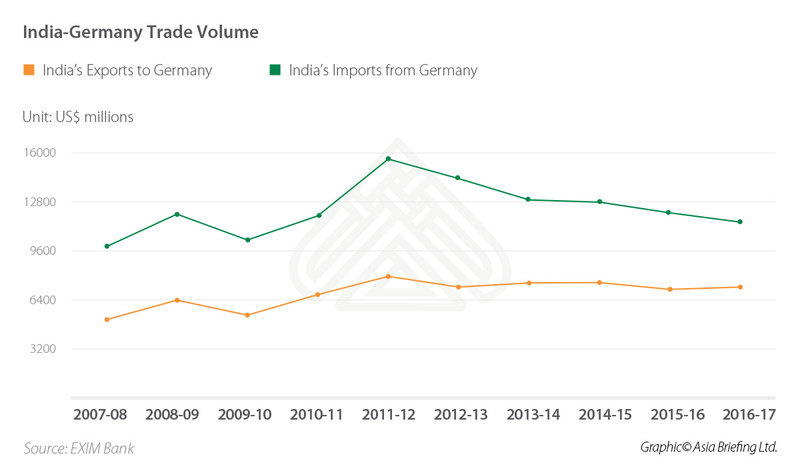 India and Germany do not have a trade agreement currently, as Germany is bound by the limitations of its EU membership. Instead, India is seeking a free trade agreement with the European Union, called the Broad Based Trade and Investment Agreement (BTIA), which has Germany’s support. 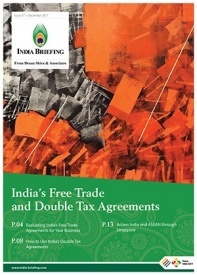 Negotiations over the BTIA have been stalled due to disagreements over IPR issues and import duties. However, post-Brexit, EU members have showed renewed interest in materializing a deal with India to counter competition from Britain. Meanwhile, private sector collaboration between the two countries is thriving. Associations such as the Indo-German Chamber of Commerce and India Germany Export Project (IGEP) create opportunities for businesses in both countries to exchange ideas and experience. 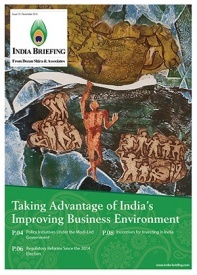 These associations work in tandem with their respective governments to promote business ties between India and Germany. 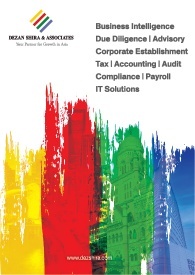 Below mentioned are the contact details of Indo-German business associations based in India.